Microsoft Ghana’s Mobile division is at it’s best again with an Achieve more Lumia promotion. They have in the past organized the Make it Happen promotion that saw five people win cars and the Lumia Make It Happen promotion that saw some people win a sponsored trip to Singapore. The new Achieve More Lumia promotion offer by Microsoft Ghana’s Mobile division has been running from the 9th November and ends on the 11th of December. There are some cool prices to be won. Maybe in a bid to ready the market for the upcoming new Lumia devices; Lumia 950, 950XL and 550. There are some cool prices to be won. 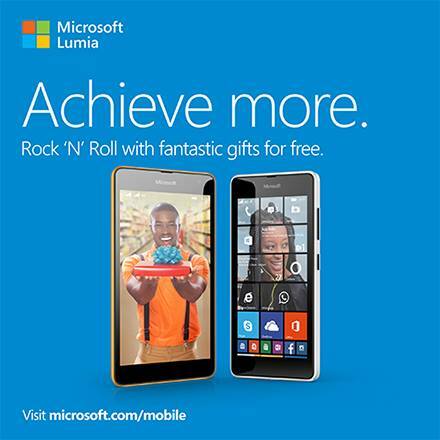 WIN great prizes like laptops, phones and shopping vouchers in the Lumia Rock ‘n Roll promotion. To enter, buy a Lumia device between 9 November and 11 December and bring your proof of purchase to one of our 4 redemption centres and you can ‘Rock’ the lucky dip bag and ‘Roll’ with whatever you choose! Centres located at Circle (Accra), Tema, Kumasi and Takoradi Market. T&C’s apply. If you have been planning on getting yourself a Microsoft Lumia device, Christmas couldn’t have come early for you. Don’t forget there are four centers, Accra, Tema, Kumasi and Takoradi where you can send your receipts and redeem your prizes. All the best of Luck and come share your experience with us if you win anything. Lets know if you plan on buying a device. Also tell us what you want from your Lumia and we can tell you the best device based on your budget.